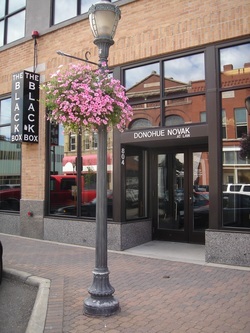 Donohue Novak At Law is a small professional law firm that has been serving St. Cloud and Central Minnesota since 1896. The firm takes pride in representing clients in many areas of law and is grateful for the word of mouth advertising provided by past and present clients. We take each matter serious as the matter is serious to our clients. Whether you are in need of a simple Will, complicated business advice, guidance in municipal or governmental matters or have other legal concerns Donohue Novak At Law can be of assistance. We have the experience, knowledge and wherewithal to help you and look forward to working for you. Providing probate, estate, DWI and other legal services in St. Cloud, MN since 1896. Join us at the Black Box.